Those familiar with painting over wallpaper will shudder at the mention of plasticiser. Painting directly over vinyl wallpaper can cause the plasticiser hidden in the vinyl wallpaper to migrate through to the topcoats affecting the cure of the coating and leaving a sticky surface. To alleviate this problem many simply removed the wallpaper, expending much time and energy in the process, before coating the surface in paint. While this resolves the sticky surface issue, it is a resource intensive option and not for the fainthearted. Recognising the need for a quick and easy method of coating vinyl wallpaper, Resene have introduced new Resene Vinyl Wallpaper Sealer. Designed to be applied direct to the vinyl wallpaper, Resene Vinyl Wallpaper Sealer seals in the plasticiser leaving the surface ready for finishing with the desired topcoats. Those wishing to take advantage of the texture of the existing wallpaper can safely seal the vinyl wallpaper with Resene Vinyl Wallpaper Sealer and follow this in the desired topcoats leaving a freshly coated surface with the texture of the original wallpaper. A smooth solution to a once sticky problem. 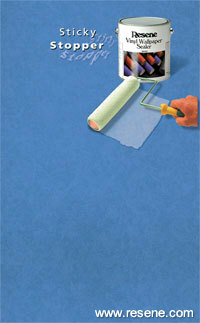 Resene Vinyl Wallpaper Sealer is available exclusively from Resene ColorShops and Resellers.